with all due respect, buddyfight ace is decent, it really is. this is because, while ace/shin branches off in terms of prior continuity, its characters and storyline are rather basic and rushed. unlike prior seasons where the main cast got plenty of time to develop, ace focuses SOLELY on 4 main characters: masato, yuga, ranma, and subaru. two of these characters can be summed up with basic applicable tropes; masato is the generic sports kid while subaru is the genius. other characters exist, but rarely impact the story directly. but there is, of course, ranma and yuga, the two true "main" characters. i'll have to say that this is where the season truly shines - ranma's betrayal is the result of jealousy towards his best friend yuga, of whom hes known since childhood. the two are obviously very close, but as time progresses, ranma finds himself wishing for yuga's defeat during buddyfights. without explicitly spoiling things for potential watchers, ranma gets corrupted, but this 'corruption' is interesting due to the fact that he is sentient the entire time. his actions are a reflection of his innermost feelings, of which waver greatly throughout the season. so, if its an overall interesting premise, why such a lackluster rating? its because of how rushed the final product is. getting into specific details would mean mentioning bushiroad as a company alongside buddyfight as a game with the intent to make money. please keep in mind that a majority of what i say here is mere speculation, but the truth of the matter is that this season has an incredibly low budget. animation errors an re-used frames are more apparent than EVER before. on top of this is the blatant disregard for a majority of the cast, almost as if the team planned for them to be used later on, but never go around to it. all in all, ace is alright. its okay, but not something i'd recommend unless you're a fan of the series or love this kind of content to begin with. the two main characters have a very interesting, personal dynamic, but the remaining cast leave a lot to be desired, as even their character arcs feel rushed or nonexistent. designs are solid and creative, as with every other season of the series. music is catchy and unique, albeit a bit overused, but like the length of the series, ace doesn't overstay its welcome - but it doesn't push boundaries or showcase particularly unique development, either. but hey, some people really liked ace/shin buddyfight, and that's fine. give it a try if you're into the game or characters, just don't expect a high level of development and seriousness. ... with the exception of ranma, of course. 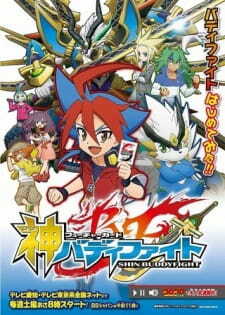 This was a far better show than the previous Buddyfight animes. As that seemed to drag on too much. But this. This was a nice breath of fresh air. A great way to start a new series. Or least one that's set in the future from the previous series. It's a great watch! You should really give it a try if you haven't already. Even if card games aren't your cup of tea, as they touch on some heavy subjects within the main plot, and they handle it pretty well. The characters are also quite good too! They are all unique in their own right! Above all else, a great card game anime.